I have been sick finding all of the corruption going on. It is mind boggling & it encompasses, the Washington State Bar, The 1st division of the Appeals Court, the Supreme Court, ALL of Snohomish County down to many cities, private law firms, Senators & many many others. It took me some time to connect the dots & there are still many to go. So hopefully by Monday I’ll have a series of articles that will lay out some of what I have found. This is so big that it is going to have to broken down into bite sized pieces so a normal human being can wrap their heads around it. Here are just some of the stories I am working on. Evidently even if you are an attorney if you don’t “play the game” you get conspired against & disbarred. Don’t even bother fighting back because evidently they have a pattern of deciding cases at training sessions, NOT at the actual hearings, via ex-parte communication. So this person probably spent 100’s of 1000’s of of dollars to save their reputation & career & but these 2 guys decided before the hearing that they were going to be destroyed no matter what. No conspiracy “theory” here, this is a true conspiracy & furthermore it is illegal for 1 or more people to conspire against another under color of law. These are 2 hearings officers who are supposed to be hearing a case in a lay courtroom, not at training sessions. Now being “lawyers” they will try to dispute it & say it means something else but I have addtl documentation to back this up. I always do when I’m dealing with people like this. It means exactly what it says. I would like ANY lawyer who has been disbarred to contact me ASAP because I have far more documents. I think it’s time for you to file a class action lawsuit against the WSBA. 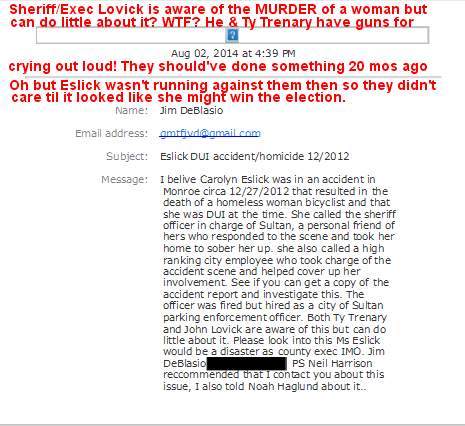 There was NO concern 20 months ago that a young woman’s life was taken UNTIL it looked like Eslick might actually beat out Lovick. This guy tries to tell us that “there was very little that Lovick & Trenary could do about it” THEY HAVE FREAKING GUNS FOR CRYING OUT LOUD & THEY HAVE BADGES! If they are so impotent that they can’t handle a case that is handed to them then DON’T VOTE FOR STUPIDITY. As far as I am concerned they need to be brought up on charges if any of this bullcrap is even true. We know some of these cops are dirty so I wouldn’t bank on it. I have many more stories with documentation but so far we have cops covering up a crime, who don’t do anything until it becomes an election issue. 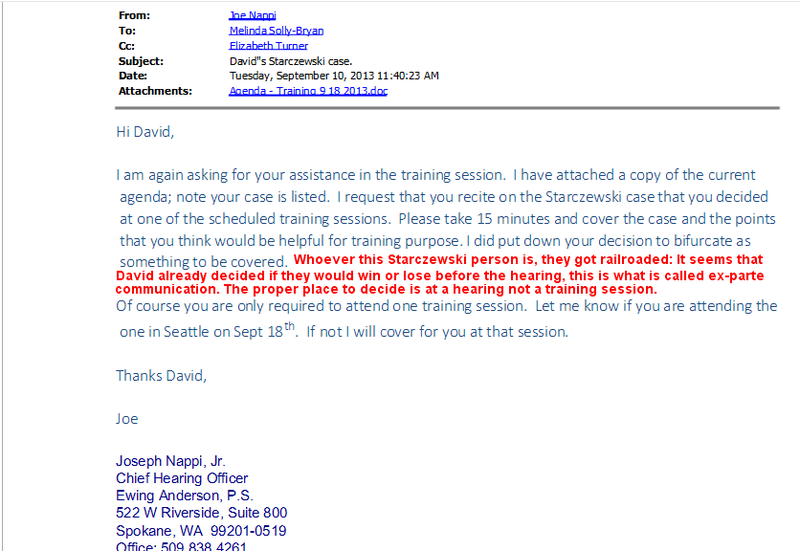 The Bar Association screwing people out of their life’s work. I predict there going to be a lot of throwing others under the bus goings on, but the time for covering their own butts passed a long time ago, namely when they took what I loved most in this world. Judging from the 400 different people who were on my website & my blogs this last weekend you & I both know what info I have. You all know what you’re guilty of. Your reign of terror & destruction is coming to a very distinct end very soon. This entire state, the counties, the judiciaries, the courts & the quasi govern~mental agencies are going to be buried in litigation for years to come. Somehow someway I am going to find as many folks as I can that have been swindled & abused by these people & everyone is going to be held accountable: Which means I better file my Federal Lawsuit against them so I can get a jump on the one’s who’ll come behind me. I gave them (the city of Everett) the chance to give me back my pets, drop their false charges & pay me for the destruction of my life’s work but Mayor Ray Stephanson gave them the go “to shut me down at all costs, so I’d learn a lesson” basically he gave the city prosecutor an open checkbook to the tax-payers dollars & they have squandered onver 1.5 million dollars to railroad me for a 1000.00 fine. Now you tell me how I can possibly lose in Federal Court once I show them all of my evidence: Yes, someone leaked the info to me so I know exactly how it went down & I now have the proof. Now they crossed the line once more by issuing a warrant for my arrest BEFORE my legal remedies had been exhausted & then tried to get my attorney to sign over my animals. They just can NOT stop screwing up, they feel they are so far above the law that they don’t even try to cover their tracks & that is exactly what is going to be their downfall. Stay tuned for further developments: This is going to be one heck of a wild ride! 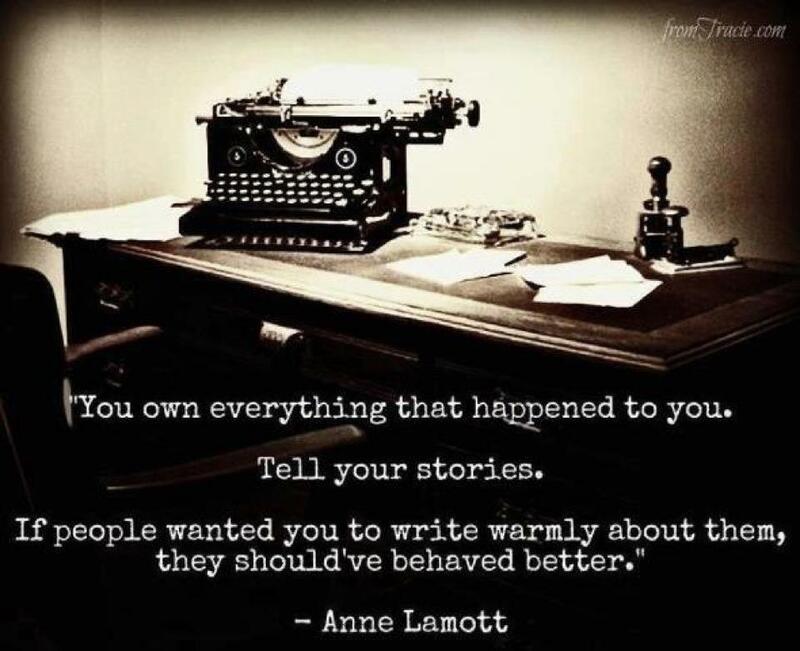 Remember this: You should’ve behaved better!!! « The Common Law Grand Jury movement v Lawyers and their stranglehold on our country.